Scones are a memory trigger for me. I’m instantly transported back to my growing up days and the many scones and cups of tea I enjoyed with my sweet mama, sometimes while we watched an hour of the BBC Pride & Prejudice or a portion of Anne of Green Gables. I love those memories, and I love that now I’m in my kitchen making scones with my little girl and sometimes watching Anne of Green Gables with her! That sweet circle. Cranberry-orange is a favorite scone flavor of mine, particularly in the autumn. It was not clearly not autumn when I made these for the first time a couple of weeks before Christmas, but I had cranberries that needed to be used and my decision was made. 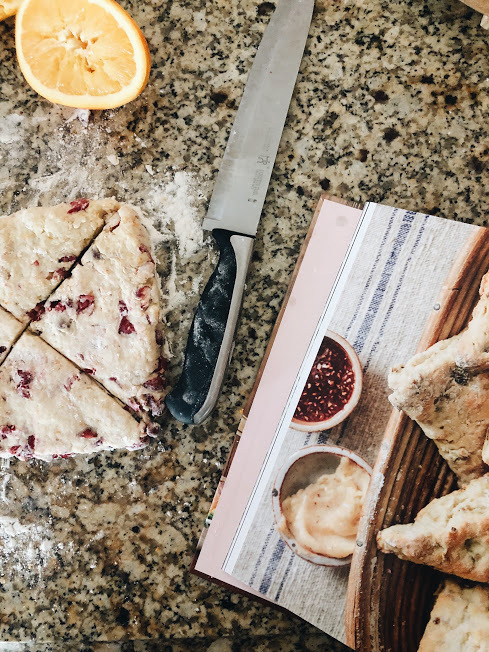 Also, I had been so eager to try out Tiffani Thiessen’s base scone recipe in my Pull Up A Chair cookbook and I had a friend coming over for coffee one morning, so the reasoning came together in quite a lovely way. When I served them that morning both my friend, Liz, and my J voiced their approval wholeheartedly. J said they were the best scones I had ever made and Liz said they tasted like a bakery scone! First of all, they are both so sweet. Second of all, I don’t know if I’ll use another base recipe again. I’m linking Tiffani Thiessen’s Blueberry-Lemon Scone recipe here which has the base I used from her cookbook. Add in all the ingredients through the milk and then you can add in my additions here. They are so simple and so very yummy. Enjoy, my friends! "Cooking well doesn't mean cooking fancy." Such good words. Wasn't she just a wealth of culinary wisdom? I think I should frame this for my kitchen. It's a good reminder for me, for what I want the heartbeat of our kitchen to be. I want to cook well; to learn and love the art of it, to stretch myself, to know my ingredients, to get comfortable creating on my own, to make good food, whether it's scrambled eggs, a simple salad, or a charcuterie board. A part of this comes from the atmosphere we create in our kitchen, I think. I want to bring people into my kitchen, to let my kids make messes -- heck, to let myself make a mess, to be brave with flavors and attempt new things like homemade pasta. I want our kitchen to be a place where people desire to be, to nurture that atmosphere of good food and great conversations. I want to do things well, just as Julia said. This kitchen journal is my desire to document not just the new recipes we try and love, but much more than that, the scenery that's going on behind those recipes. I want to document what we were doing, what was the atmosphere in our home, who was present, what was my heart feeling, what did I notice in that moment on that day in this sweet sacred space: our kitchen. On this particular evening, I was craving some alone time. The afternoon had held a very fussy baby, a sad Anna Kate who had spilled hot chocolate on our off-white carpet (the day we finally get to rip that carpet out will be one met with much rejoicing), and a needy puppy annoyingly begging for her dinner. I was feeling a bit frayed. Enter some evening sunshine and that superhero man I'm married to. Once I got the babe asleep, he took the fur-child and our big kid out for a walk in the brisk February air and said, "enjoy yourself, love." A calm fell over the house. I'm learning in those first moments of calm to just be quiet for a minutes, to reset my heart a bit, to ask the Lord to help me make the most of the time and bed ready to meet my people well when they walk back in the door. With Sinatra and a glass of moscato as my companions, I set to making dinner. Greek Chicken Souvlaki and Potatoes from Half Baked Harvest were on the menu that night. It was chopping, tossing, and sneaking bites of feta and kalamata olives as the evening light poured through the window. The pan went in the oven (this recipe is delightfully simple), the rice cooked up, and I set the table, swaying to "the way you look tonight" as I laid the plates and forks on the table. J and AK walked in at just the right time, red-cheeked from the chill and ready to settle into a warm dinner. The meal itself was a winner, but more than that, it was conversation around the table, hearing about the walking adventure, a peacefully sleeping babe, and the faces of the ones I love most. It was a real evening of "us", marked by the still very new adjustment to life with 2 little ones, a reminder of where I must always draw my strength, and a sweet husband handing me a bit of time. The Lord is so good to meet us in our imperfect ordinary. He doesn't waste a thing. I never mind when the granola jar gets low because that just means more needs to be made, and there's little else that makes the house smell as good as it does when we bake granola. This is a recipe from my sweet momma, as so many of our favorite recipes are, and it continues to be passed on and on. It has become a staple in many of our friend's homes after they've tried it here. It's so simple to make and easy to add your own spin to so it can please every palate. And you can double or even triple it if you want to gift some of it or use it as favors for a shower, as we did for my little sister's wedding shower earlier this year. I mean, how cute are little mason jars filled with granola and tied with a bit of twine or ribbon?? So, my friends, welcome to our kitchen again. I hope that this granola feels just as cozy to you each time you make it as it does to me. In a large bowl combine the oats, nuts, coconut, brown sugar, wheat germ, and flax seed. In a separate bowl combine the maple syrup, oil, salt, and vanilla by whisking together well. Pour onto a lightly oiled baking sheet. Bake for 1 hour and 15 minutes, stirring every 15 minutes to achieve an even color. Remove from the oven and allow to cool. Add dried fruit, chocolate chips, or whatever else you prefer. Revel in the glorious smell and enjoy!